1. Mix the chicken and harissa together. Heat the oil in a frying pan and fry the chicken and red onion for 5 minutes. 2. Meanwhile, place the couscous in a large bowl and pour over the stock, cover and leave for 5 minutes. 3. 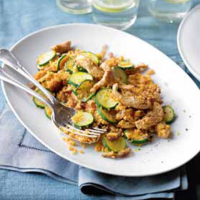 Add the courgettes to the chicken and cook for 5 minutes (ensure the chicken is cooked through). Fluff the couscous with a fork and stir into the chicken with a dash of water. Heat through for 1–2 minutes and serve.